One of the things Richard van den Broek of Outside Concepts Sydney West does really well is, design his outdoor structures to meet the rigorous bush fire standards in the Blue Mountains. This client initially wanted a timber gazebo with hardwood floors. However, they also lived in a Bal 40 zone precluding them from using any structural or cladding timber (unless protected by an appropriate fire protection system). Instead of giving up on the project Richard came up with a structure which ticked all the boxes and still delivered the outdoor living benefits provided by an Outside Concepts gazebo, patio or pergola. Free standing and supported by four brick pillars, the gazebo features a Colorbond roof and a Villaboard ceiling. The use of Villaboard in this situation requires ‘setting’ the joints. This is done by a plasterer resulting in much sturdier and seamless joints, compared to the result when using industry-standard plastic cover strips. 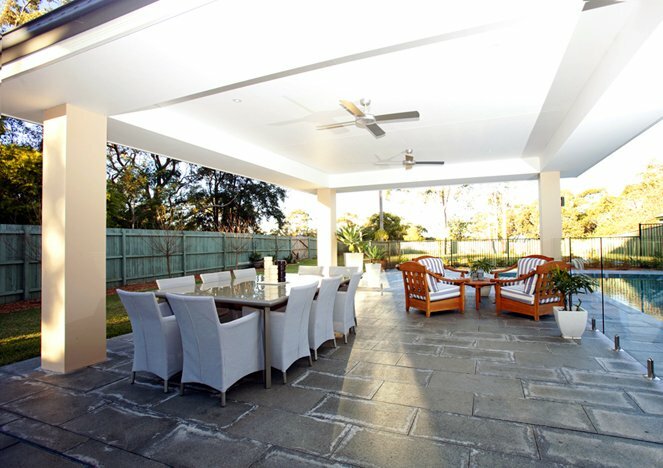 Notice the quality and style of the build – this is one of the hallmarks of Outside Concepts Sydney West – the recessed ceiling complete with fans and downlights provides a contemporary modern feel to the gazebo, highlighted to perfection by the large grey floor tiles. And all built to the exacting construction requirements of a high-risk bush fire area.